Something fun and unusual has been brewing up in my studio. Can you guess what it is? I'm too excited, so I'll just spill the beans! Every now and again, my hubby pops in to my craft space to say hi, and lately, he's been sticking around a lot. I don't mind - actually I love it - but I have noticed something. It first started with him grabbing a few colored pencils and making me a lovely drawing. Then, a few days later, he picked up a watercolor brush and doodled a bit of color onto a pad. The next time he visited, I had a set of cards stamped and embossed, and I just so happened to leave one on his side of the table. I colored mine, he colored his, and when we were done, we had each made a little card, and I couldn't believe my eyes! His card was beautiful and so thoughtfully colored. We sometimes talk about how much we both loved coloring books in our childhood, so I can see why he really enjoyed taking the time to color. And that is when an idea sparked up! I asked him if he would be interested, and he was all in. So, dear friends, today marks the very first day I will be sharing not only my cards, but HIS beautiful creation, too! And today also marks the first day of a new series I will be featuring from time to time here on the blog: His and Hers - a different take on the same design. First up, I wanted to share the card I had in mind when I stamped these. I was going to make a set of cards with this pretty fushcia flower - and all were going to be roughly the same in design. 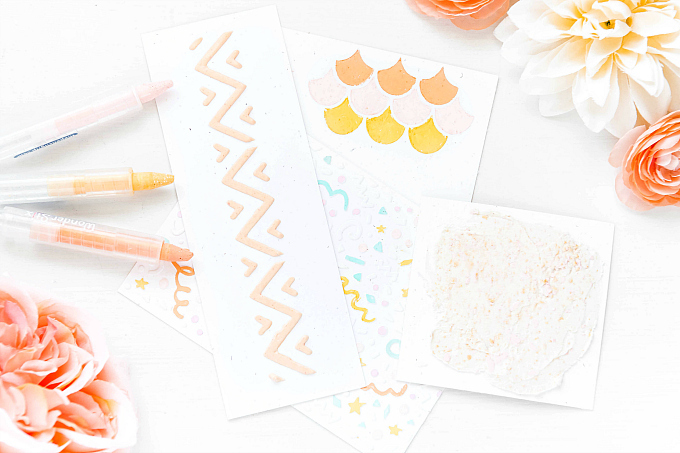 But it's SO much more fun having a different take, and a colorful bundle to share! 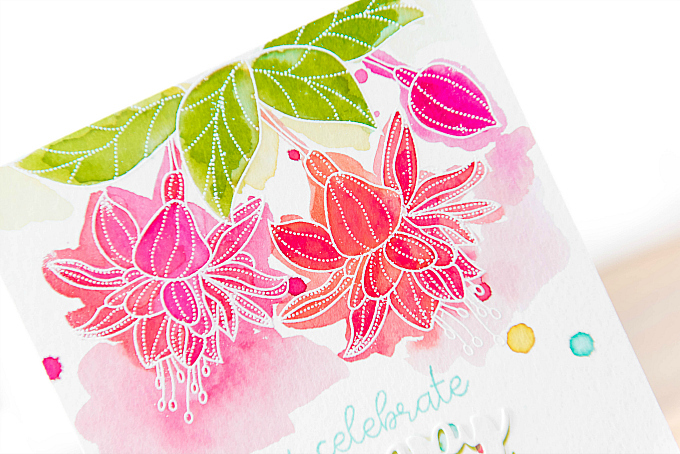 To make this card, I started with a stamped and embossed fuchsia flower bundle (discontinued TCM stamp, similar here, here and here). 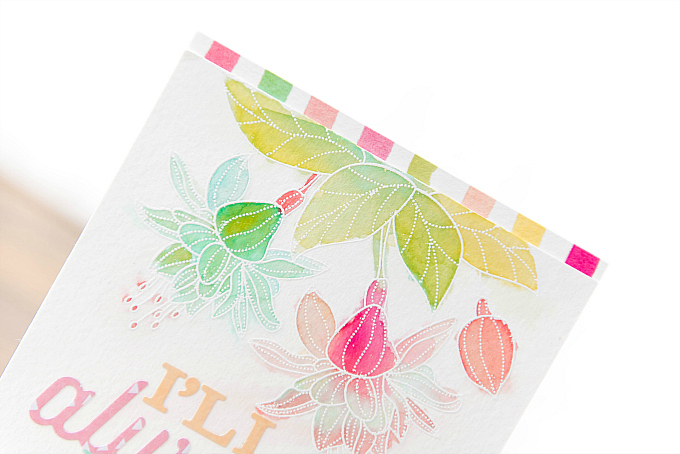 Soooo many pretty fuchsia stamps coming out this week everywhere! I used my new Daniel Smith watercolors to color in the flowers. I used this beautiful red, fuschia, and orange color. For the leaves, I used my Zig Clean Color Real Brush Markers. 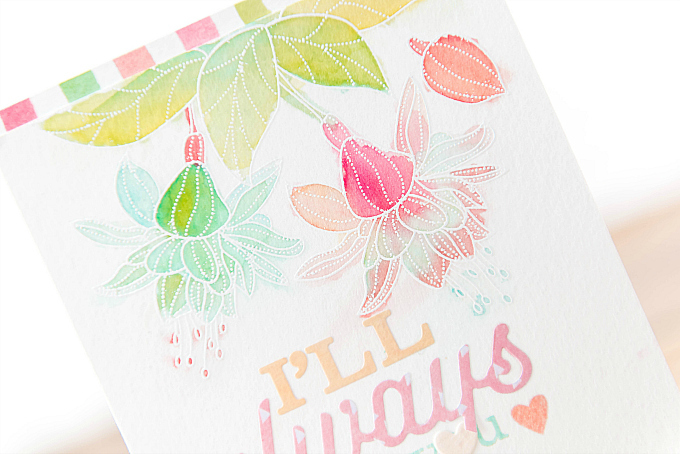 Since I used my stamp block to blend the pretty watercolors, and the puddles of water looked so pretty, I really wanted to use them up. 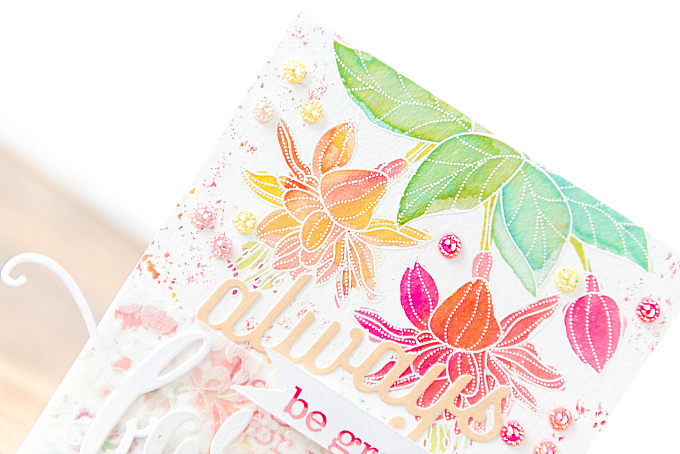 I let the puddles dry a tiny bit, and then smooshed the stamp block around the card, to create a speckled look. I absolutely LOVE how this turned out! 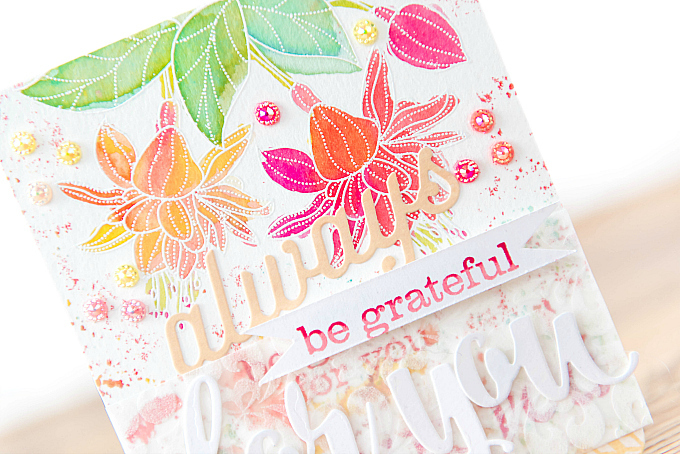 The mix of all the pretty tones is just so yummy and it reminds me of delicious sprinkles scattered all about. For the sentiment, I used PTI's Phrase Play #2 die, and Echo Park For You designer die. 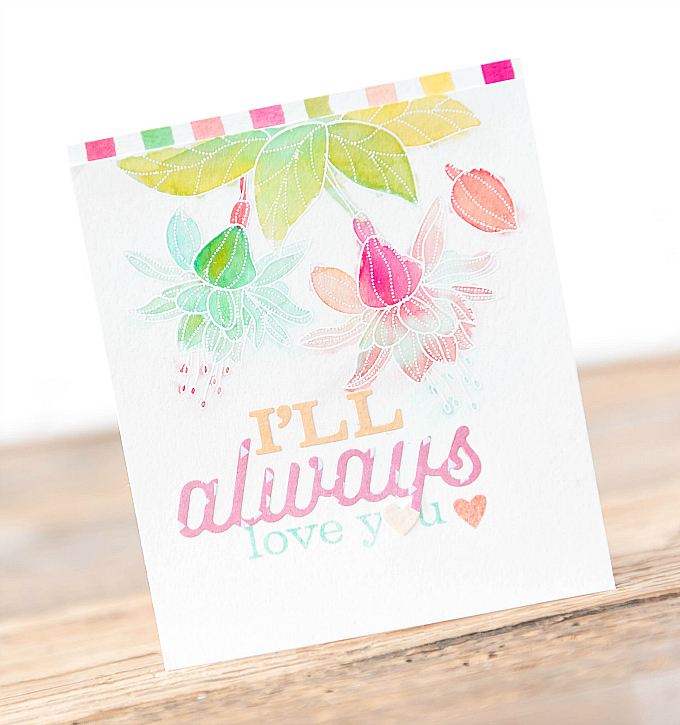 I used PTI's Phrase Play #2 stamps for the stamped sentiment, stamped in an ombre tone of Pale Peony and Pure Poppy. 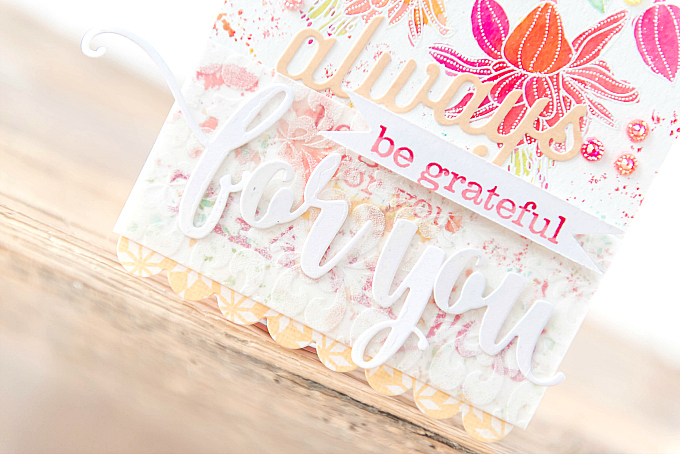 At the bottom, I added some textured vellum, and stamped the sentiment sentiment again a few times, for a layered look. I tucked in a wee scalloped border at the bottom, too. To finish the card, I used some of the darling rhinestones - which you can win by leaving a comment on this post before May 16th! Isn't it beautiful!?! I still can't believe the gorgeous watercoloring he did! He used my Zig Clean Color Real Brush Markers to color the flowers and leaves. 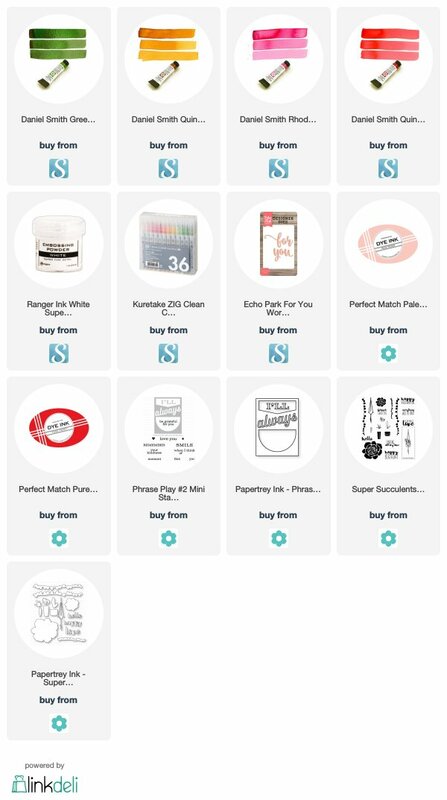 For any of you that think it would be fun to get your hubby or other family members in on the crafting fun, I highly recommend these. They make watercoloring so easy and fun! He was so creative, and made a little striped paper to match, using my Spectrum Aqua Markers. At the bottom, we used some more diecuts from PTI's Phrase Play #2 die and stamps. I couldn't be more proud and grateful for our time spent together. And before I go for today, I'm sharing one last card, that was a collaboration between us both! I loooove how the Daniel Smith watercolors really shine here...They're so vibrant and saturated with color! We used Rhodonite Genuine, Quinacridone Coral, and Green Apatite. 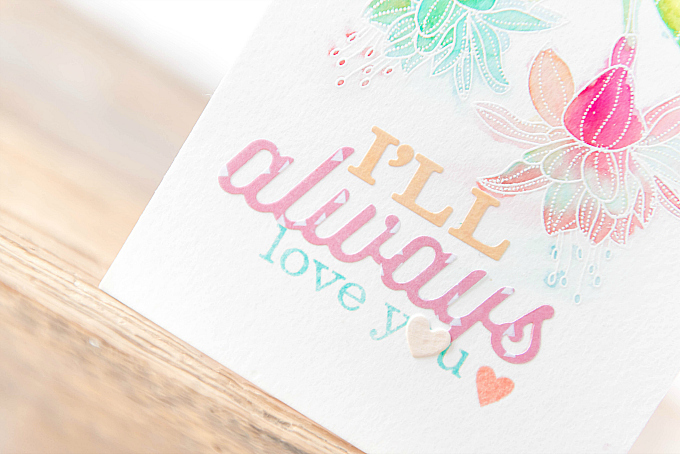 We added a few watercolor dots around the card. And for the sentiment, used PTI's Super Succulents stamps and dies. I hope you enjoyed this special post today, and if you want to see more, stay tuned for new His and Hers cards coming soon! Ivana!!! I cannot tell you how much I enjoyed your post today ... mostly because I love both versions, and think it's the most romantic thing to craft with ones spouse... but also because I had my own husband in my craft room a few days this week! No water coloring, a bit more industrial, but I can't wait for you to see OUR card! Bravo, Mr. Ivana!!! I cannot wait for the next collaboration! Gorgeous work M...! (oh, and you too Ivana : ) lol <3! I'm lucky that my wife shares my craft space. We have made cards together, and we sew together. There is much to be said about a couple sharing in a hobby! Oh that is so wonderful!! I am so inspired that you two share a space together and enjoy not one, but two crafts with each other! I can only imagine how lovely that would be! When my hubby visits my crafty space, even just for a few minutes, it brightens my day immensely! It really is quite special to be able to share a hobby together, isn't it? Oh I LOVE that your husband pops in and likes to create with you!! I wish mine did!! He tries to avoid it at all costs!! LOVE all of your beautiful cards that you created. The watercolor is just STUNNING!! 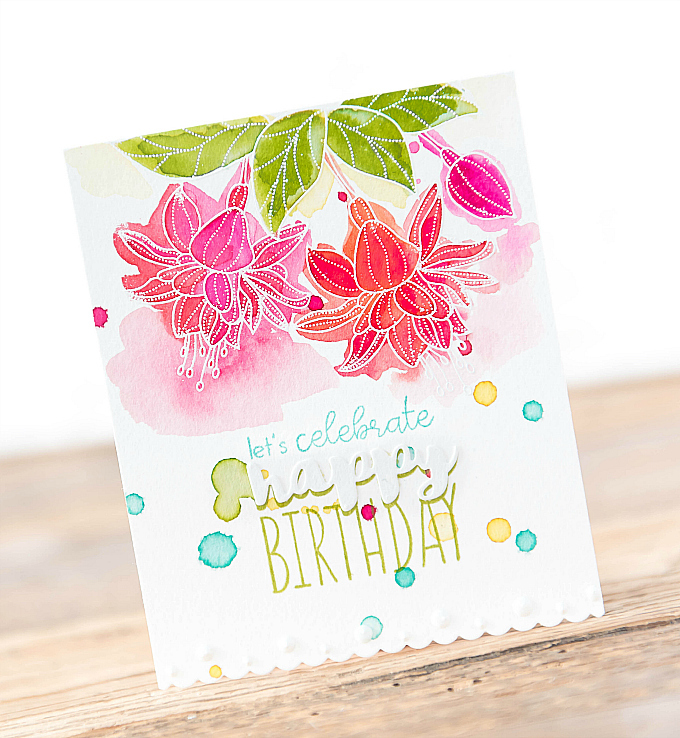 I like the first card with all the fun stamping and the fabulous layers that I adore with your cards. I also like how you husband's card is so simple but the colors so beautiful. Really lovely design!! OH MY GOODNESS!! You are both so incredibly talented & how fabulous to create together! I honestly love all the cards--can't even pick a favorite! 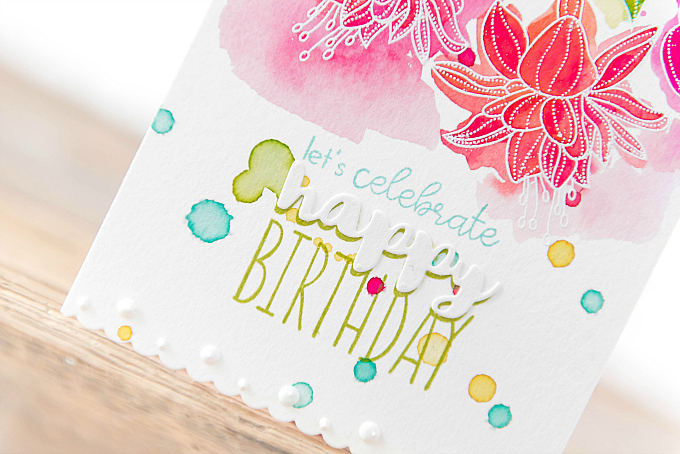 Using the left over ink for the splatters is gorgeous & the striped strip hubby created is perfect! I'm just totally in awe & so look forward to the next installment of this series, Ivana! Geta, my hubby has been so blown away by all the sweet comments - yours included! I think you may have all convinced him to give crafting another try :) So I think we will have a new installment soon! Biggest thank you for always sprinkling so much sweetness here and for making my day brighter! Aw, thank you sweetie! I can't take all the credit - the mr. has been on a pretty solid road to becoming a pro! Thanks for all your love and support, dear friend!